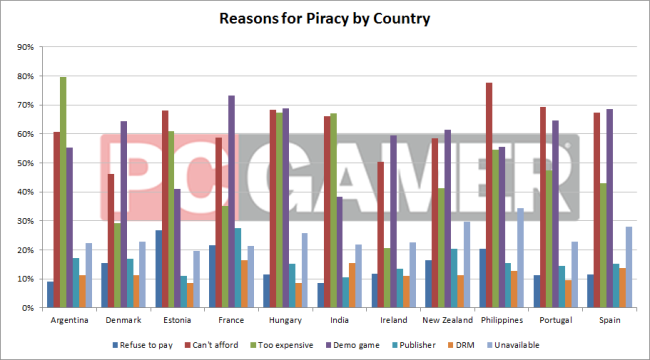 An anonymous survey by PC Gamer of over 50,000 gamers has revealed a number of stats that paint a picture of just how prevalent piracy is among PC gamers. Unsurprisingly, the figures are not nearly as high as past Ubsioft CEO’s claim of 93%, but hover around a far more realistic 35%. The number is certainly large, considering the survey also found that “90 percent of PC gamers have pirated games at some point in their lives,” but there are several other nuances to the results. 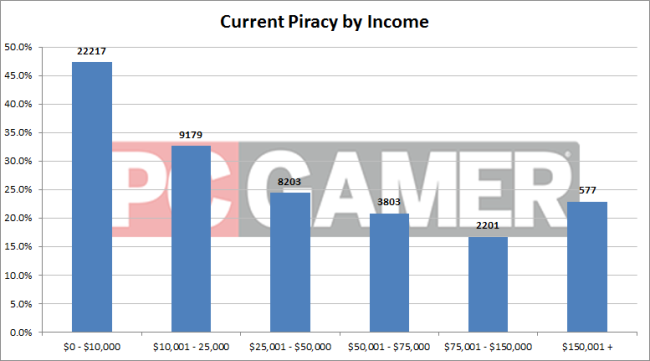 It’s clear that there is some link between age and income, and piracy levels. 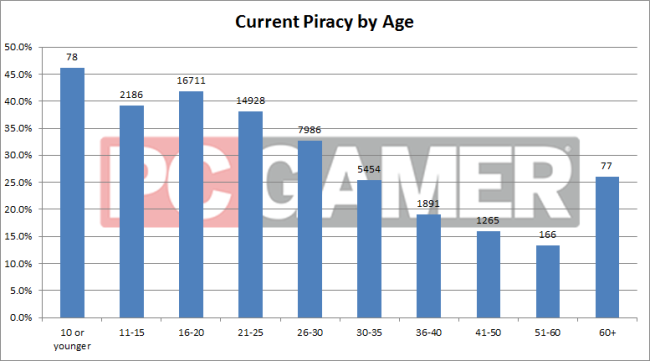 PC Gamer speculates that the spike in both the 60+ age column and $150k income bar “is likely heavily skewed by joke responses to the survey.” However, the rest of the data makes it evident that it’s primarily young, lower-income individuals who pirate. An area of special interest to Indian gamers is the above graph, according to which, approximately 60% of respondents from India claim to be pirates. This would seem worrying for our gaming scene, but it’s important to contextualize the cost of gaming in our local economy. In an argument that parallels our own experiences, PC Gamer says “we spoke to a pirate who lives in Bulgaria, who explained a new game on release day costs almost a third of a minimum wage earner’s monthly income (imagine new games costing $400 in the US). “The thing is, they think $50 and €50 is the same for every country, but it’s not, because the wages and economy are different,” said the pirate.” Meanwhile, respondents from countries with much higher average incomes, such as Norway, the US and UK report much lower rates of piracy, in the mid 20s. 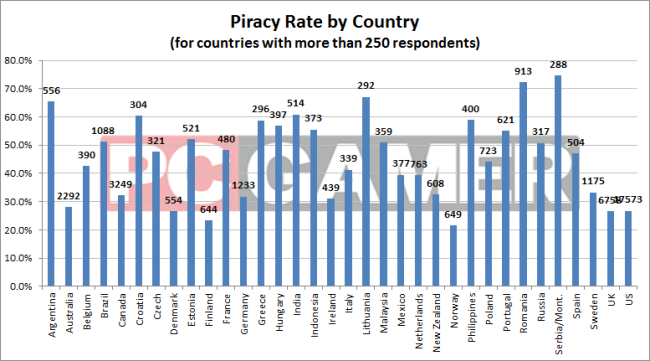 There are some interesting observations to be drawn from this data, that can hopefully help the gaming industry delve into the reasons for piracy, and how to strike a balance. Clearly, many gamers come back into the fold of wholly legal purchases, so the question now remaining is how to convert the remaining 35%.